These images from NASA's Spitzer Space Telescope of Comet ISON were taken on June 13, 2013, when ISON was 312 million miles (502 million kilometers) from the sun. The lefthand image shows a tail of fine rocky dust issuing from the comet, blown back by the pressure of sunlight. The image at right shows a neutral gas atmosphere surrounding ISON, likely created by carbon dioxide fizzing off the comet at a rate of 2.2 million pounds per day. A comet that could put on a dazzling show when it zooms through the inner solar system later this year is already blasting out huge amounts of gas and dust, new observations by a NASA spacecraft show. 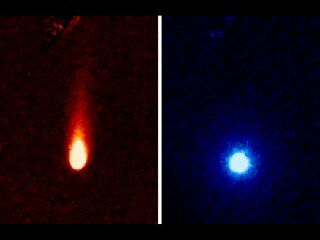 Images taken on June 13 by NASA's infrared Spitzer Space Telescope reveal that dust and carbon dioxide gas are streaming off Comet ISON, forming a tail about 186,400 miles (300,000 kilometers) long, researchers said. "Previous observations made by NASA's Hubble Space Telescope and the Swift Gamma-Ray Burst Mission and Deep Impact spacecraft gave us only upper limits for any gas emission from ISON," Lisse added. "Thanks to Spitzer, we now know for sure the comet's distant activity has been powered by gas." Comet ISON was 312 million miles (502 million km) from the sun — 3.35 times farther than the Earth-sun distance — when Spitzer made the new observations, NASA officials said. The comet, which is about 3 miles (5 km) wide, is cruising toward a close encounter with the sun on Nov. 28, when it will skim just 724,000 miles (1.16 million km) above the solar surface. ISON could blaze up dramatically around this time, perhaps shining as brightly as the full moon in the sky, researchers say. But there's no guarantee that ISON will live up to the hype. For example, it could break apart as it approaches the sun, fizzling out as some other "comet of the century" candidates have done over the years. While it's tough to predict the behavior of any comet, forecasting ISON's sky show is particularly difficult. Scientists think ISON is making its first-ever trip to the inner solar system from the distant and frigid Oort Cloud, a huge repository of comets that lies between roughly 600 billion and 6 trillion miles (965 billion and 9.65 trillion km) from the sun. Comet ISON is becoming more active as it warms up during this epic journey. Researchers expect to get an increasingly detailed look at ISON's composition over time, because different materials boil off at different distances from the sun. "Much of the carbon in the comet appears to be locked up in carbon dioxide ice," Lisse said. "We will know even more in late July and August, when the comet begins to warm up near the water-ice line outside of the orbit of Mars, and we can detect the most abundant frozen gas, which is water, as it boils away from the comet." ISON's solar flyby promises to be more than just a skywatching spectacle. Comets are primordial bodies composed of water, ammonia, methane, carbon dioxide and other materials — the same fundamental building blocks that gave rise to the planets 4.5 billion years ago. "ISON is very exciting," Jim Green, NASA's director of planetary science in Washington, D.C., said in a statement. "We believe that data collected from this comet can help explain how and when the solar system first formed." The comet was discovered last September by amateur astronomers Vitali Nevski and Artyom Novichonok. It takes its name from the equipment the duo used — the International Scientific Optical Network (ISON) near Kislovodsk, Russia.